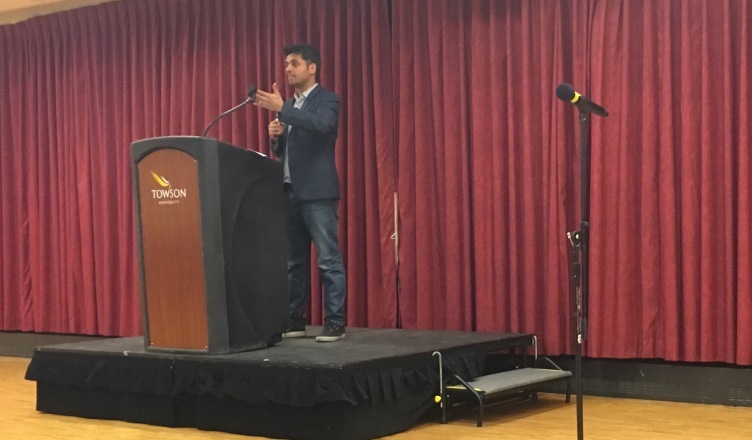 American Muslim Wajahat Ali, who wears many hats — journalist, playwright, attorney and State Department consultant — fought Islamophobia through historical precedent and personal narrative Thursday, Feb. 16, during a talk sponsored by Towson’s Center for Student Diversity. “The diverse stories of 1.7 billion Muslims and 1,400 years of rich, dynamic Islamic civilization have been reduced to a singular stereotypical image – rage boy,” Ali said. “If you don’t write your stories, your stories will be written for you,” Ali said. He cited “Iron Eagle,” “Aladdin” and “Back to the Future,” wherein a Libyan terrorist kills Doc Brown, as stereotypical, harmful imaginings of Muslims that ought to be replaced by realistic narratives. Ali told the audience that he was born and raised in California, and that he went to preschool knowing only three words of English but went on to graduate with a degree in English from the University of California, Berkeley. He compared being Muslim at school to being one of the popular kids. “Everyone’s giving you lavish attention – even the people you want to avoid,” he said. There have been many people in the western mainstream press who have also been writing the stories of Muslims and creating negative stereotypes, Ali said. What people know about Muslims is overwhelmingly negative due to the sensationalized stories shown in the news media. He said that an influx of Muslims came to America in the 1500s and that up to 15-30 percent of slaves in the slave trade were Muslim. “If you think about it, Muslim blood, Muslim sweat and Muslim stories have fertilized this country’s soil from the beginning,” Ali said. Ali said that since the start of Donald Trump’s political campaign, anti-Muslim hate-crimes in the U.S. have risen 67 percent, and the number of anti-Muslim hate groups are up 197 percent in the U.S. There has been a spike in employment discrimination against those with “Muslim-y,” or stereotypically Muslim-sounding, last names and an increase in bullying of Muslim children in schools, he said. Senior Sarah Kirksey said she thought Ali’s speech was interesting and that she didn’t expect as much humor as there was. “He made a lot of good points…. I’m happy that there was a lot of people here. It’s interesting to hear it from a Muslim’s perspective and for him to just come up and be so comical about the whole thing,” Kirksey said.